The first screen presents you with a list of your motivational pictures and a thumbnail preview of each. Tap on the “+” button on the upper-right to create a motivational poster. Tapping on an item in the list of motivators will open that poster for editing. 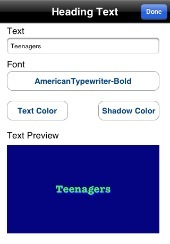 Plain — a solid background color with a picture border that matches the heading text color. Expressionist — a shaded picture border that transitions from the background color on the outside to the tagline color in the inside. Classy — a steel-shaded background color with an embossed picture border. The Camera icon at the upper right allows you to take a snapshot via the built-in camera (iPhone only) or select a photo from your photo library to use as your poster’s photo. The Tagline button allows you to edit the small text and modify its font and colors. The Folder icon exports your poster into your photo roll. To return to the list of motivational pictures, just tap on the Motivators button in the upper-left. While editing the heading or tagline text, you can also select a font face for the text and choose a text or shadow color. To turn off the shadow, just select a fully transparent color. The Text Preview box shows you the text that you type with the selected font and colors, along with the current background color of the poster. When selecting a color, tap on one of the crayon to select that crayon’s color. You can also tap on the crayon’s edges to get a slightly brighter or darker color, which is the crayon’s gradient. Fine-grained adjustments are done via the Hue, Saturation, and Brightness sliders below the crayon. Additionally you can also specify a semi-transparent color by adjusting the transparency slider.